Looking for an easy way to add fall and winter interest to your landscape? Ornamental grasses are the answer! Fall is a great time to plant them, and you’ll see their visual impact immediately. To top it off, their ecological impact is far greater than their visual impact and goes beyond your own backyard. During the growing season, many species of butterfly larvae (caterpillars) feed on the blade of native grasses. In fall and winter, grasses provide protection and nesting material for birds, small mammals, and insects. They are especially useful to the overwintering larvae and adults of beneficial insects. 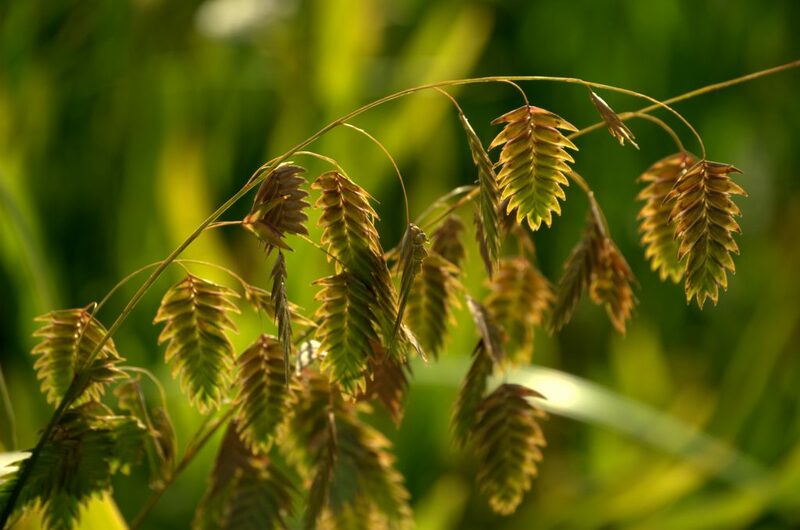 Grass seed heads provide food for songbirds, insects, and small mammals. Their tough foliage clumps, whether dormant or growing, slow stormwater run-off, allowing it to re-infiltrate the water table. 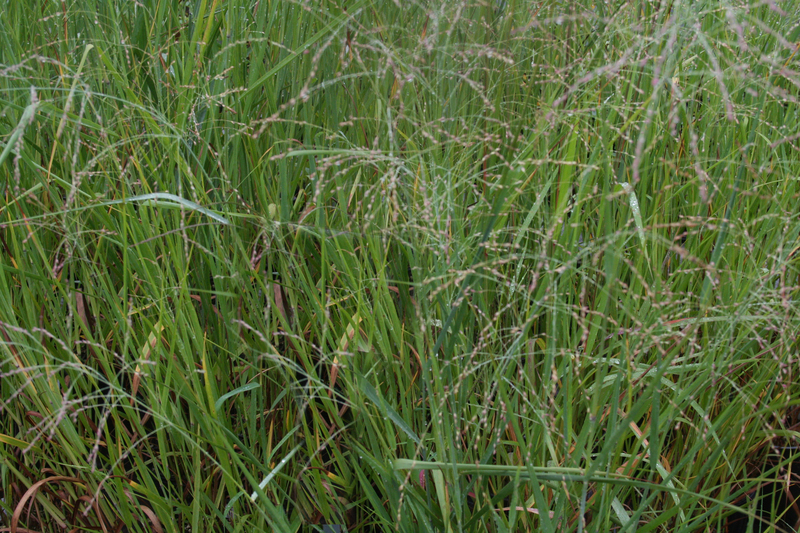 Below ground, the deep roots of native grasses provide more unseen ecological benefits. They help stabilize the soil and reduce erosion. About a third of the massive root system of native grasses is replaced with new roots each season. As the ‘retiring roots’ decompose, they return nutrients to the soil, increasing its fertility. There is one beloved insect in particular that benefits from native grasses – the firefly. These nocturnal insects spend most of the day on the ground, concealed by long grasses. At night, they crawl to the tips of grass blades and fly into tree branches to signal for mates. 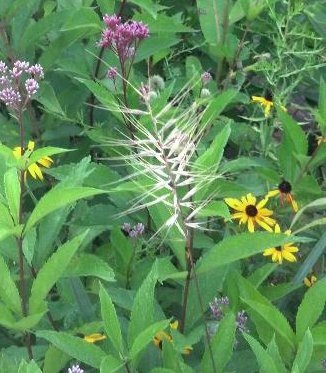 If you intersperse tall native grasses in a tall perennial planting, they help hold the plants and heavy seed heads erect, so they don’t ‘flop’– allowing birds, pollinators (and you!) to spot them. Planted in large groups or swaths, they provide a dramatic element and can serve as a dense screen. Their golden fall color heralds the changing seasons. Their tall seed heads sway in the wind, adding movement to the still winter landscape. Lower growing species such as Prairie Dropseed provide fine textured mounds and can be used as a specimen plant or filler. 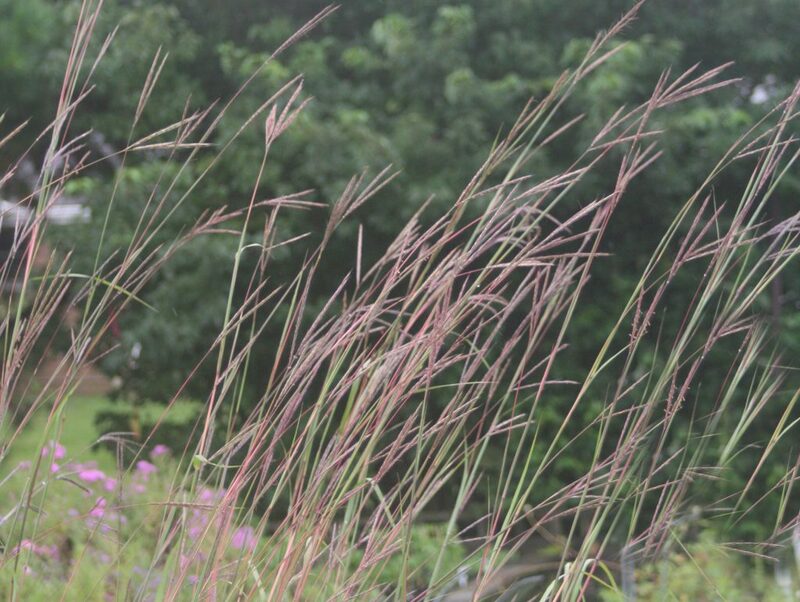 Try any of the native grasses in containers. They will make a dramatic vertical statement and provide interest even when the rest of the container plants are dormant. Dried grasses are an excellent addition to flower arrangements, too. 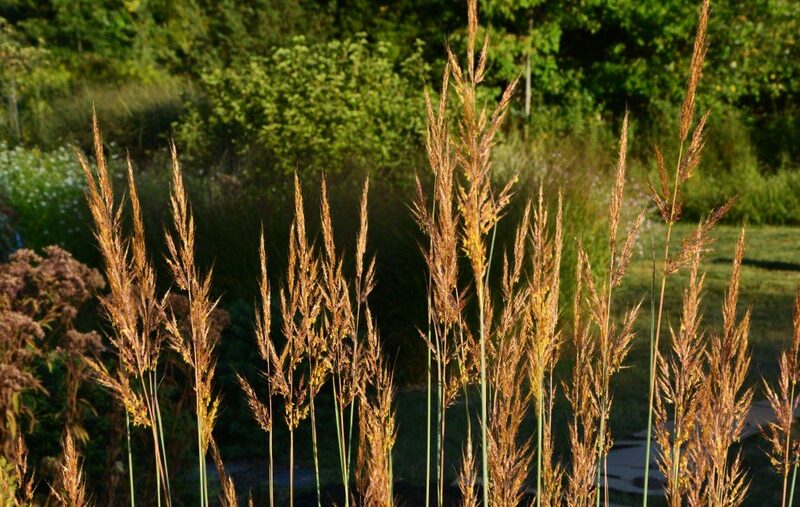 There is no need to cut native grasses back in the fall – their dormant blades and seed heads provide important ecological benefits. If they start to flop or break under the weight of ice or snow, cut or trim for neatness sake if you wish. In spring, cut back last year’s growth if you want them to look fresh and green throughout. If not, it’s fine to let the dormant grass blades mix in with the new. If you want to divide one of the clump forming grasses, do it in fall. Cut it back so you can see the clump Dig the clump out of the garden and use a sharp shovel, an axe or hacksaw to divide the clump into smaller pieces. Replant immediately. Bottlebrush Grass is one of the few grasses for part shade to shade. It will place itself in niches here and there, sending up its delicate seed head to mix with other flowers in your garden. Widely adaptable. The seed heads resemble bottle-brushes and rise 12”-18” above the foliage in mid-summer. They slowly fade to tan throughout the summer and fall. Prairie Dropseed is a low growing, fine textured, clump forming grass. Great for edging in a formal garden. Drought tolerant, it takes full sun and turns orange in fall. ‘Heavy Metal’ is noted for the metallic blue-green color of the grass blades. It is strongly vertical and is between 3’ and 5’ tall. ‘Prairie Sky’ grows 3’’-5’ and boasts powder blue leaves . Shenandoah turns a deep maroon as the season progresses and is one of the shorter switch grasses, topping out at about 4 feet. Soft blue color and gentle seed heads take on a slight reddish glow in the fall. will spread aggressively. Nodding oat-like clusters of seeds, with their golden fall glow. Good naturalizer for dry shade, where the lack of sun and moisture may keep is aggressive nature in check. Indian grass Sorghastrum nutans Bluish green foliage turning a translucent yellow-deep gold fall color and bearing panicles of copper seed heads fleced with yellow in fall. Big Blue-stem (Andropogon gerardii) The king of native grasses with 3 fingered seed heads in August, and handsome gray to blue-green stems in spring turning to green in summer then to red in fall. Clump forming with excellent drought tolerance once established. Prairie Dropseed – new growth mixed in with previous year’s dormant blades. I have never have seen such a sharp focus on the plant stock that all Pennsylvanians should be growing. Kudos to Edge of the Woods!